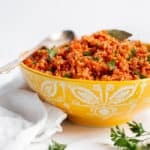 Jollof Rice Recipe inspired by my AncestryDNA Results - This is a true West African classic. Fragrant rice is steeped in rich ingredients like meat stock, garlic, onions, tomatoes, and spicy chilies adding an incredible depth of flavor. Heat olive oil over medium heat in a large pot. Add onions to pot and saute until tender cooking roughly 5 minutes. Next add in minced garlic, ginger and chili and cook for about 30 seconds making sure not to burn the garlic. Pour in rice and stir to combine with other ingredients allow rice to toast in pot for 2-3 minutes. Next add chicken stock, crushed tomatoes, seasoned salt, smoked paprika, curry powder, thyme, paprika and bay leaf and stir together then bring to a boil. Once it begins to bowl, reduce heat to low and cover pot with lid. Continue cooking rice for about 25-30 minutes or until all liquids evaporate and rice becomes more tender. Remove bay leaf. Turn off heat and allow rice to rest for 10 minutes with lid on. Once rice is completely tender, make sure all ingredients are stirred together. Top with parsley and bay leaf for garnish and serve.